This is so light and just beautiful. Although I need to make her something dark-ish to wear underneath so you get the full effect of the lace. I am knitting but in dribs and drabs, basically when I get half an hour! 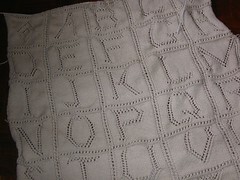 I have started the border on the alphabet blanket, so will hopefully get that done by the end of the weekend. 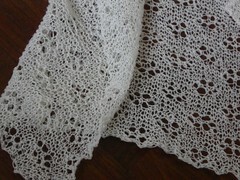 It doesn’t look all that flash at the moment but wait until it’s washed and blocked!